Have You had Your Regular Check Up Recently? Despite their importance in everything we do, most of us take our eyes for granted. Many people can’t remember the last eye exam they had. Chances are we’re more focused on the timing of oil changes in our cars than on the ongoing health of our eyes. Having your eyes checked regularly isn’t some mindless chore just for the sake of it. Regular eye exams can spot problems such as macular degeneration and glaucoma before they really take hold. Early diagnosis can mean the difference between a loss of some or all of your sight or not. Visual Acuity Tests—These exams measure the patient’s distance and near vision using projections and eye charts.Cover Tests—These tests check how both of the patient’s eyes work together to diagnose strabismus, binocular vision, and lazy eye. We cover one eye and watch as the patient focuses on a small object. Color Blindness—Tests to determine whether the patient has a full-color vision, even if the patient may not be aware that he or she does not. Retinoscopy—This is the test where the patient looks at letters on the eye chart looking through the retinoscopy machine. We flip different lenses in front of the eyes to find an approximation of your eyeglass grade. Refraction—This is combined with the retinoscopy test using a phoropter with changing lenses to get the exact measurement for your eyeglass or contact lens prescription. Autorefractors—These tests automatically measure the patient’s prescription by machine. These are especially helpful for children who may not communicate as well during manual refraction tests. Aberrometers—These work the same as the autorefractors, but use wavefront technology, which studies the way light travels inside the eye. These tests are used for LASIK procedures. 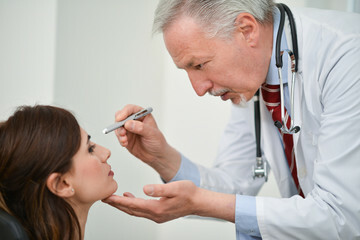 Slit Lamp Eye Exams—These test uses a biomicroscope to check the health of the patient’s eyes and detects serious eye disorders and infections. The magnification allows our doctors to see the front portion and the internal structures of the eye. Glaucoma Tests—These test measure the pressure inside the eyes, otherwise known as intraocular pressure. Increased pressure is the first sign of glaucoma. Is it time to schedule your next eye exam? Call us at Millennium Park Eye Center, (312) 996-2020 to make your appointment. © 2019 Millennium Park Eye Center and MedNet Technologies, Inc. All Rights Reserved.